We know about the can-and-string telephone. A widespread and long-distance telephone network based on this technology clearly requires some way to extend this maximum distance. The level of technology of this society comes before the invention of any electrical devices such as motors, lamps, heaters, batteries or anything else powered by or involving electricity. They have steam power and natural-gas lamps and other gas equipment. They can make machinery to good tolerances consistent with the above. We can assume if necessary that they employ brass or other corrosion-resistant wires under tension rather than string. These may be enclosed in pipes to avoid noise from the environment. 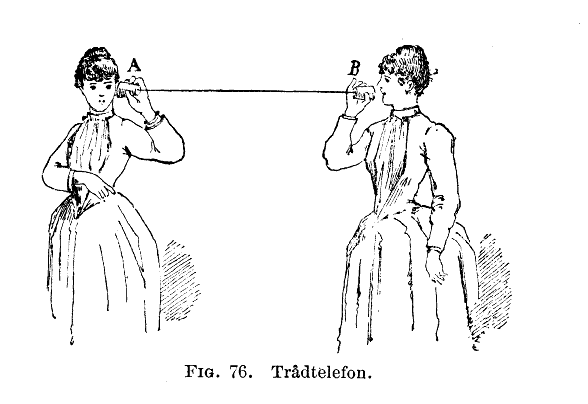 The whole purpose is that people should be able to talk normally to each other so this is a telephone rather than a telegraph. Using only steam, gas and mechanical devices, how can they have repeaters in their system that both clean up the audio and amplify it for transmission to the next repeater? Maybe these amplifiers mean that much longer distances are possible between repeaters. First, let me congratulate you for choosing a maximum 100' distance. While others argue about the longest that string can be, the reality is that every time you connect something to the string to hold it up you dampen the signal. so, ideally you want the pole holding the string up to actually be holding the repeater mechanism such that the string can hang free for highest quality transmission. My first solution is to use two funnel-shaped objects. The string is tied to the pointy ends and the whole contraption is mounted on a pole. One half (call it the incoming half) is acting like a megaphone to amplify the signal. The second half is acting as a compressor (think "stethoscope") to apply the signal to the next length of line. Because no active amplification is occurring, this would only benefit you for a couple of hops. It would need to be soundproofed to ensure the environment (dogs barking, rain falling) didn't drown out the signal. Factually, this probably wouldn't work (or, its efficiency would be very low) because you have the same energy going out as you have going in. Megaphones aren't magic. They don't amplify anything. What they're doing is more efficiently transmitting sound waves (e.g., more of the sound you're naturally making is being directed toward where you want it to go). However, this works both ways and is therefore cool. This won't be the case with our next item. But we want an actual amplifier, thanks! Let's use water in the same way you use your car's brakes. the incoming sound is hitting a "master cylinder" full of water. The sound moves through the water to a secondary (and much, much smaller) cylinder. The output of that smaller cylinder will be amplified. Note that we're not actually trying to move the sound "through" the water (in fact, moving the sound into a third medium simply reduces efficiency). What we're trying to do is move the water. Small movements in the master cylinder translate to large movements in the secondary cylinder. Factually, sound on a string probably wouldn't create enough audio-force against the surface of the water to get sound out the other end. Water might be too dense to do this with. However, it would make a cool experiment. The concept is sound, just the string might be a problem. The energy coming out the other end is very low. It might actually be easier (or beneficial) to use this other than a simple can to capture the original signal and boost it into the string. Also, this only works in one direction. You would need two strings, one to hear and a second to speak, for each user. One ore complicated solution is the compressed air gramophone using a pneumatic amplifier. A pneumatic amplifier was realized by using a sensitive valve, which required little force to operate, to modulate the flow of a stream of compressed air. The basic principle of the valves used in these devices was to pass the stream of compressed air through two partially overlapping combs. The sound vibrations to be amplified were applied to one of the combs, causing it to move laterally in relation to the other comb, varying the degree of overlap and so altering the flow of compressed air in sympathy with the sound vibrations. This would be the mechanically most complex and expensive solution (also requiring two-way communication), but it would allow you to transmit almost any distance. However, putting one of these every 100 feet would be... impractical. The cost of maintenance would infinitely exceed the value of the solution. It was a gramophone (not interesting for you) coupled with a pneumatic amplifier that let the mechanical vibrations control a stream of high pressure air through a special valve. You can use this amplifier in your telephone system, but noise would probably overhelm signal after only a few retransmittings. It seems that mechanical filters capable of acting as low and high pass filters were quite common, even to the point that they were included trough transducers into electrical circuitry, but obviously these can not remove all form of noise and correct more complex disortions. Look up the Pulsion Telephone - A mechanical telephone with a claimed range of 3 miles. This would let you greatly extend the distance you needed between repeaters. Another technology that may help create a solution is Acoustic Mirrors as passive amplifiers. And don't forget the power of human labor. A bank of "Telephone operators" hired to listen to the end of one wire and speak into the end of another solves the repeating and switching problems simultaneously. There are several factors affecting the useful range of a string telephone, mostly concerning the transmission medium, i.e. the "string". Modulus of Elasticity: Materials with a low modulus of elasticity do not require much force in order to deform them. In the case of a sound transmission medium, low modulus of elasticity means that the material will absorb more sound than a substance with a high modulus of elasticity, particularly in higher frequencies. Density: Heavier materials require more force to move, so lighter materials will absorb less sound energy. Friction: Friction between the moving string and the surrounding air will absorb energy from the string, so ideally the string would be suspended in a vacuum tube. So, given the steampunk setting, a reasonably available lower density material with a high modulus of elasticity might be a metal such as Beryllium. Osmium has a higher modulus of elasticity, but is much denser, and ceramics tend to have very high moduli of elasticity, but are brittle. An ideal substance would be carbon nanotubes, with low density and a very high modulus of elasticity, but this is not quite in keeping with the steampunk setting. As for amplification, a fluidic amplifier has no moving parts other than moving streams of air or liquid, and hence is very robust and reliable. If miniaturized, they could have a frequency response sufficient to amplify the human voice. So, we can envision a system of beryllium or carbon nanotube wires running through vacuum tubes carrying sound, and fluidic amplifiers - and other fluidic logic components - in the place of an electronic or electromechanical telephone exchange. Given the propensity for the components involved to dampen high frequency sound, this system would sound much like a modern telephone system, since modern telephone systems also clip high frequency sound. However, the effective range of such a system may be somewhat less than an electronic or electromechanical telephone system, and it would have a higher infrastructure cost, especially if evacuated tubing was used to reduce friction losses. As any system with multiple booster amplifiers, eventually noise will be amplified to the point where the signal is lost in the amplified noise. So, the person sending the message will physically tug on a spring in a pattern matching the wave form of the message. On the other hand, the string is attached to a spring and a pen. 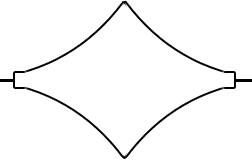 The receiver moves a piece of paper at a constant rate while the string moves, drawing the waveform on the piece of paper. After the message is complete, the receiver can look at the waveform and infer what the message. Not the answer you're looking for? Browse other questions tagged science-based alternate-history steampunk or ask your own question. How can brain information be transmitted through a mobile network? How practical and possible is a monomolecular string weapon that can be controlled?